If you've been following Omiyage Blogs for awhile, you might have noticed that we love kirigami! With Halloween around the corner, how about some festive papercutting for the occasion? Try making spiderweb kirigami! 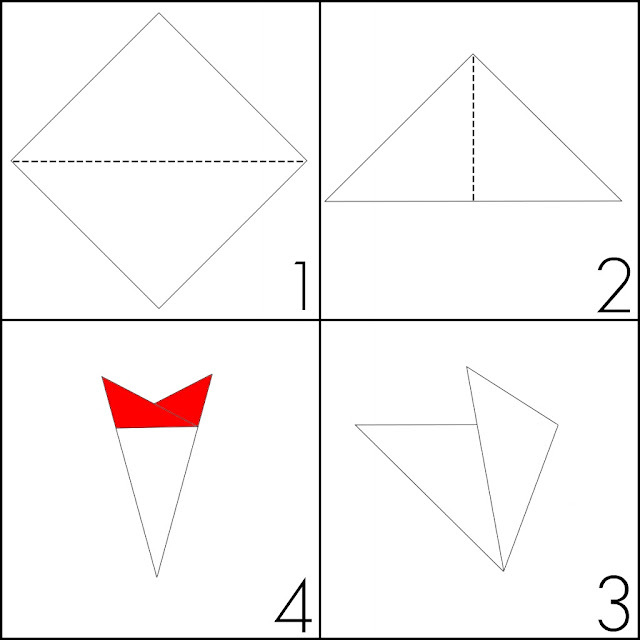 Start with a piece of square origami paper in your desired size. We used our favourite 50 Colours Origami Paper - the 7.5cm / 3" size. 1. Fold paper in half diagonally. Crease well. 2. 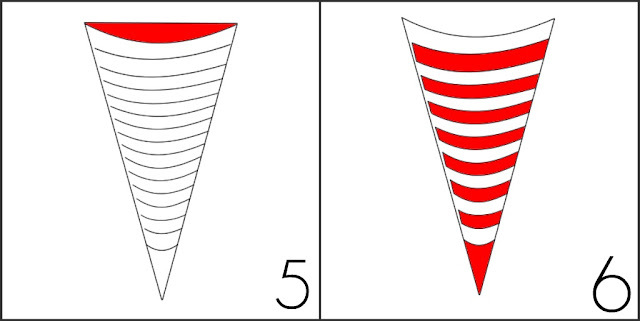 Fold paper in half again. Crease well. 3. Turn paper so that the top point is facing down / towards you. Visualize dividing the triangle into 3 equal parts. Fold the right third towards the left. Crease well. Then fold the left third over the right. Crease well. This part may take practice or refolding to get three equal parts - no worries, just keep trying! 4. Cut straight across the top of the folded triangle. Discard the paper parts in red. 5. Cut the top of your triangle into a curve. Discard the red part. 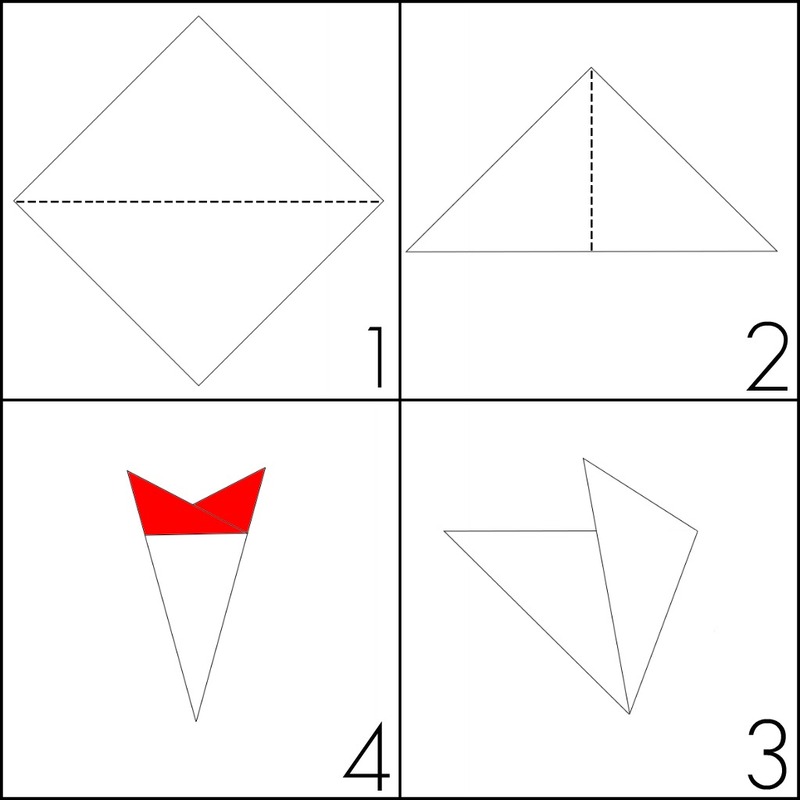 Copying the top curve, cut lines along the entire length of the triangle leaving a thin line of paper at the end of each cut. Cut as many strips as you can / would like. 6. Cut out every other strip - seen in red - and discard. Cut off tip. Don't cut off the tip until all other strips have been cut and removed - just in case! 7. Carefully unfold to discover your kirigami spiderweb. If desired, you can gently press with a warm, dry iron to remove creases. 8. Use your spiderwebs anyway you'd like - decorate a table, string into a garland, use in a handmade card. Happy spiderwebbing! 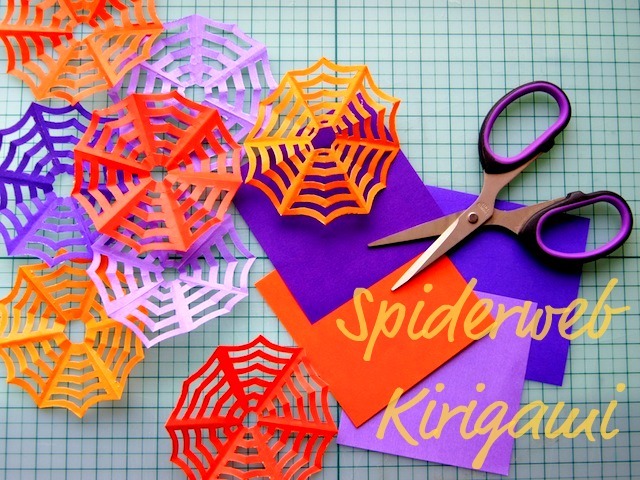 If you cut some spiderwebs of your own, why not share images of your creations on Omiyage's Facebook page! These were great fun to make. Plus with a couple snips, you can make bats out of the points you cut off the top! Glad you liked our spiderwebs! Oh dear! Sometimes it takes a few tries - sorry for the frustration! Make sure your folds are creased really well and edges lined up before cutting. Using a bone folder to make your creases might be helpful. 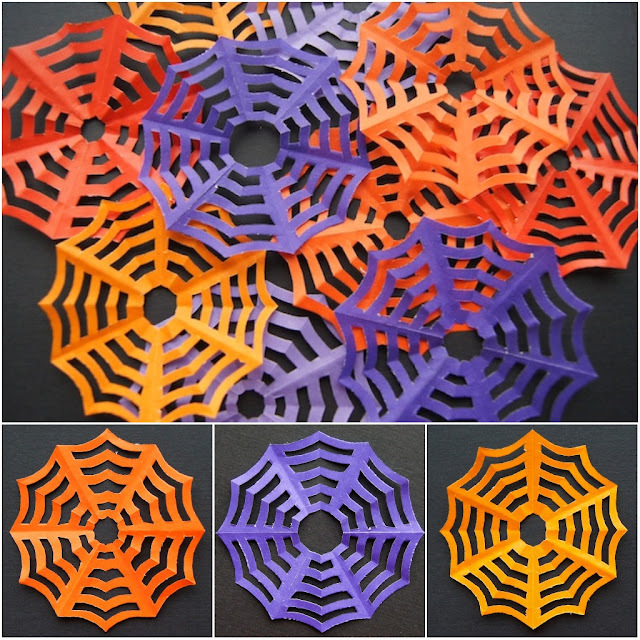 Use a thin paper designed for folding (we recommend origami paper) - especially if you are making small spiderwebs. Use a small pair of sharp scissors. Cutting with large / dull scissors can be frustrating. For your first few tries leave a larger uncut line of paper on the uncut edge. As you decrease the line in each subsequent spiderweb, you'll find the right thickness for you / your paper / your edges / your scissors. Good for him! Hope you had better luck in the next round. Thank you for sharing this file. It is really appreciated. Awesome tutorial once I understood it properly. hahaha. Also ended up with 2 pieces of spiderwebs that dont look nothing like it, even though I followed instructions, think they're not clear enough. I just made three of these. One big one and two smaller ones I taped them to my window with a strip coming down from one with a paper spider hanging. It looks cool. My girls like it. This was so fun and I did it on the first try. Am I crazy enough to try this with second graders next week??? Yes, I think I am! Glad to hear you were successful! Good luck with your class! Going to try this with my grandchildren next time they come! I've made it... the first attempt, I can't believe it!!!! Beautiful!!! Thank you! I have just discovered your web. I will teach my students tomorrow, thank you from Spain!! Love these! I am dyslexic and I got this the first time. Was so gosh darn proud made them all day in lots of sizes! Thanks so much for sharing this. You have a great blog with great ideas!